Dressing forceps are used when dressing wounds. They hold gauze and other dressings. They may also be used during wound debridement to remove infected or necrotic tissue or debris from the wound. 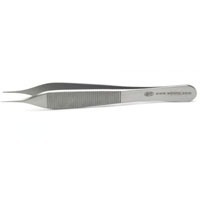 They may also be used for suturing.